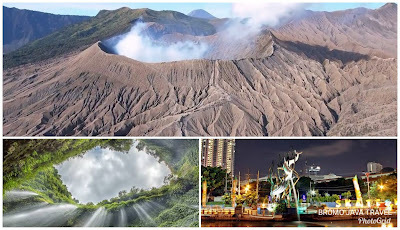 Mount Bromo Sunrise, Waterfall, Surabaya City tour is one of 3 days 2 night Mount Bromo tour starting from Surabaya Airport and finish in Surabaya Airport again at afternoon. within 3 days 2 nights Mount Bromo, Waterfall, and Surabaya City tour, You will accompanied by Our partner to see Sunrise from highest peak, Historical falls in East Java and various interested places in Surabaya City. Reach the Hotel on Bromo volcano, Check in and stay 1 night. Mount Bromo tour package begin at 02.30 AM, Our jeep driver accompaied You to Pananjakan Peak (place to see Sunrise). If You want to see Mount Bromo Milky Way, You can start from your hotel at 09.00 PM. Finish enjoy Madakaripura Waterfall trekking package, return to your car, change the clothes and take You to Hotel around Surabaya City for 3,5 hours and Stay 1 night. After breakfast, take shower, Check out from your hotel then visit some interested place around Surabaya town like Cigarette Museum, Roman Catholic church usually called Gereja Katolik Kelahiran Santa Perawan Maria, THR (taman hiburan rakyat), Submarine Museum (Monumen Kapal Selam), Suramadu Bridge (the longest bridge in East Java), Taking photo in front of the Surabaya Symbol (White Shark and Crocodile Statue). If You have more time, Our driver will accompied to Pasar Atum (Atum market), Pasar Turi (Turi market), Tunjungan Plaza Mall, typical Batik, Kue Lapis and other local souvenirs. Finsih Surabaya City vacation, Comeback to the Airport and Finish Mount Bromo Sunrise, Madakaripura Waterfall, and Surabaya City package. We also provided other iteresting place to see Sunrise, Such as Sunrise on Papuma Peak, Sunrise from Kumbolo Lake, Sunrise from Semeru volcano, and Sunrise from Ijen Crater. For detail information about Mount Bromo tour price, accommodation, and facility, You can visit Our contact.